Today as two typhoons lash Tokyo simultaneously I realise it was exactly one year ago, during another powerful typhoon, that I first put my new Cleverhood rain cloak to the test. To put it mildly, I was incredibly impressed with the results. As anyone will tell you, its much easier to sit out a typhoon if you have snacks and beer, exactly the two things we didn't have as the rain came in sideways and the typhoon moved ever closer. Under normal circumstances it would have been a long day without the much needed snacks and beer, but I had recently taken delivery of a new Cleverhood rain cloak, it looked sturdy, and I wanted to put it to the test. What better way to test a rain cloak than in a typhoon, on a daring mission for a six pack and some crisps? Looking at the Cleverhood cloak the first thing you notice is how stylish it is, as if stylish is ever something you've said about a rain cape before. The version I have would look quite at home over a tweed outfit and high riding boots, in fact given its unique waterproof design you can essentially wear what you like underneath without fear of getting wet. The Cleverhood cloak is made from a sturdy waterproof polyester with sealed seams to keep you dry in even the most inclement of weather. It is tastefully trimmed with 3M reflective tape which shines amazingly brightly under lights, but which disappears in daylight making this a very stylish but stealthy high-viz item. Two arm slits in the front of the cloak feature magnetically closing flaps so that when you draw your arms inside they automatically snap shut preventing water from seeping in. Below the arm slits on the interior of the cape are finger loops so when the rain really pours you can slip your fingers into the loops and drape the cloak over your handlebars keeping everything underneath nice and dry. The cape's hood has a wide brim, and moves around with your head so as to not cut down your peripheral vision. If so inclined it is possible to secure the hood under your helmet. The Cleverhood has elastic draw strings (internal) so you can draw the cape in closer when you're on the bike. I make good use of these because if the cape is flapping around in the wind I'm always in fear that it will catch on to a car as it speeds past. Zippered pockets and a small loop of fabric on the back from which you could secure a light or reflector are additional details that round out this amazing product. The material is hardly breathable but the cape is loose fitting enough to allow air to circulate. Also, being a cape it does not cover the lower part of your legs so in extreme conditions you may want to complement the coat with some waterproof boots, leggings or trousers, but outside of typhoon conditions and gale force winds they're not necessary. The cloak comes in its own convenient drawstring carry bag, and folds down so compactly that I carry it on every single commute to work even when the chances of rain are zero. Knowing I have a rain cape I can rely on has resulted in more riding days as I'll cycle to work knowing it will be raining on the return journey, but that the Cleverhood rain cloak will keep me dry. If I could ask for an addition to the cloak there would only be one, an internal pull tab for opening the front waterproof zipper from inside, as currently the only way to open it is to pop your arms out of the slits and use the external pull tab. A small thing, and one which may have already been included on newer designs. I don't often recommend products on Tokyo By Bike, but the Cleverhood Cloak comes with my 100% backing. This review comes after a full year of use of the Cleverhood cloak in heavy rains through Japan's notorious wet season, summer squalls, typhoons and snow, both cycling and walking. This is an exceptionally high quality product which will serve you well for a long, long time. The Cleverhood cloak can be purchased on line from the Cleverhood store. International shipping is available. Try it, you'll love it. I ordered one of these when you recommended it in an earlier article. It is great, but I do have some issues. Perhaps I'm not doing things right. First of all, in a true downpour, I definitely get very wet on my lower half. Wind doesn't help as it flaps around and allows more water in. Lately, I've tightened up the outer loops a bit, and I don't try riding in really strong rain or wind. I'm a very lazy commuter, so putting rain pants/boots on is not something I want to have to do. However, for the more typical drizzle to non-windy rain, it does work pretty well. Of course, I couldn't even dream of using it during the summer on my bike as I would be utterly drenched in sweat. Might as well go without. Then again, I had to quit riding during summer as I didn't want to take a shower when I got to work. I also use it as my primary anti-umbrella (hate those things), taking it with me whenever I think there might be rain. I do love its portability. 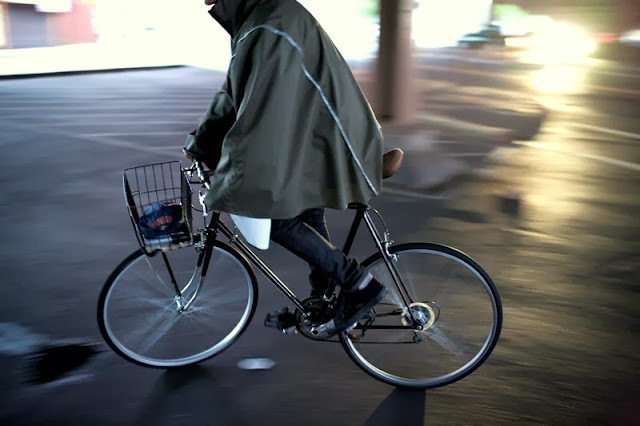 As noted in the article my bigest concern with the Cleverhood cape, and its a problem with all rain capes, when cycling is that while flapping in the wind I was afraid it would get caught on a passing car and I'd get dragged from the bicycle. But I've found that carefully drawing in the elastic prevents the cape from flapping around. One of the reasons I left it a year to write this review (apart from being lazy .. erm .. busy, yeah busy) was partly that I'd never cycled with a cape before and wanted to give myself time to get used to it. Initially I feared it would get caught in the bike, I wasn't sure how to best use the internal finger straps, should I ride with my arms inside the cape or out? Now I have a number of prefered configurations, for different weather, temperature, and modes of transport and find myself very comfortable in the Cleverhood cape. When it comes to rain gear in the Japanese summer all breathable fabrics quickly become asthmatic. At least with the Cleverhood cloak I can flap it around when waiting for traffic and get some fresh air inside. I agree with you that when it comes to walking around in the rain, especially in typhoons where an umbrella can be torn limb from limb by vicious winds in seconds, the Cleverhood cape is by far my prefered method of staying dry. Love your 2nd photo, no mudguards (fenders to the Septic Tanks), the rider will get wet from below. I'm a long-term cape user myself, they let a lot more air in than a jacket, and I like the way they cover the legs as well, instead of just pouring water on your lower half like a jacket does.